The University of New Brunswick and St. Thomas University are this week hosting the first major international conference dedicated to exploring a uniquely Canadian philosophy. Drawing on presentations and speeches by prominent and emerging scholars of philosophy from both Canada and the United States, the “What is Canadian Philosophy?” conference from Nov. 23 to 25 is being held in honour of the country’s 150th anniversary of Confederation. “This is an important time for Canada. With events as they are not only in the United States but throughout the globe, there is an intense international and national interest in the Canadian intellectual landscape – scholars and an interested public are intensely curious about Canada,” says conference organizer Jason Bell, an assistant professor of philosophy at the University of New Brunswick. The conference will explore a wide variety of topics, from aboriginal philosophy to Canadian idealism and the effect cold weather climates have on how a society organizes itself. It will also feature a talk on the philosophy of espionage – Dr. Bell will be profiling Nova Scotia-born, New Brunswick-educated Winthrop Bell (no relation), a British spy working in Germany after the First World War who was the first to publicly warn of Adolf Hitler’s plans for genocide. While other philosophies, such as German, British, French and American, are well known, Canadian philosophy has not gained as a broad an understanding. “The conference will include contributions on a distinctively Canadian philosophy: on influential Canadian philosophers, on underrepresented tendencies in Canadian philosophy, and on world philosophical movements that have found unique expression in the country,” says Dr. Matt Dinan, an assistant professor in the Great Books program and co-ordinator of the Catholic Studies program at St. Thomas University. The conference will be staged at various locations on the University of New Brunswick and St. Thomas University campuses in Fredericton, N.B. For more information, see the What is Canadian Philosophy? conference for speaker abstracts and schedule. 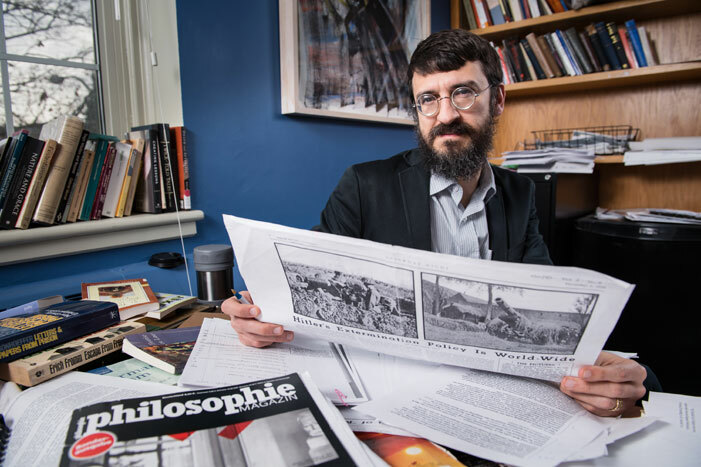 Photo: Jason Bell, an assistant professor of philosophy at the University of New Brunswick. Credit: Rob Blanchard / Photo UNB.